Ransacking the past, while denying any knowledge of it, has always kind of been the program for artists. Suppression of your antecedents is a good way to create a neat little package from your own historical moment. This was also true of pushed-to-the-sidelines non-Western traditions in art. A recent show of Picasso’s work at the Metropolitan Museum of Art in New York, for instance, gave viewers an eye-opening if perhaps not entirely intentional look at adjoining rooms full of his African and Oceanic source materials. Not that it matters much at this point. Our own historical moment has a rather more pressing need to seek out continuities with the past and other artistic traditions. Motivated by this impulse, Scream helps to dismantle another long-standing partition, between Inuit art and contemporary practice. Scream is a companion exhibition to last year’s Noise Ghost, which featured Toronto’s Shary Boyle and Cape Dorset artist Shuvinai Ashoona, and takes a similar approach, pairing Ed Pien with Samonie Toonoo, artists who reside in the same two respective locations. Resonances in their work begin with an interest in the figure; it is a common denominator that points to a primordial intelligence always at work in art. Curator Nancy Campbell makes this reading explicit by titling the exhibition after the famous painting by Edward Munch. She connects three points on a map rendered in space and time. As the show makes apparent, once these connections are drawn, certain assumptions start to become undone. The expressive potential of the figure is powerfully put to use in Toonoo and Pien’s work. Toonoo presents stone carvings, embellished with detailing – of a fur fringe on a hood or a face, sometimes a skull, carved in bone. Each carving tells a story, often tragic. 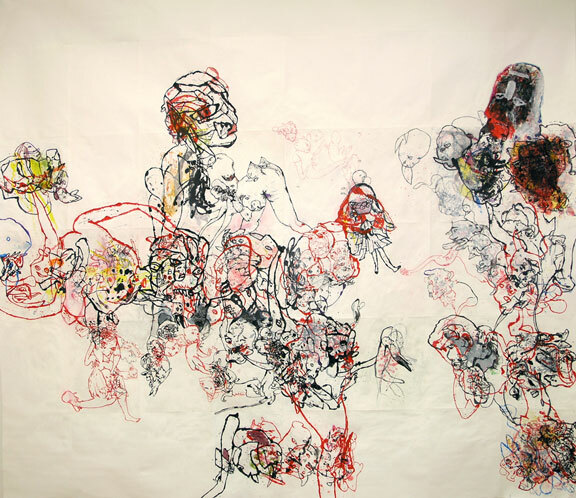 Pien’s drawings are created through a process he calls monoprinting. Taking quickly drawn sketches in coloured ink, he creates overlapping compositions with the wet ink applied to fresh paper, often placed on top of other drawings, or cut out and collaged together. Combined into large densely layered composite pictures, the effect is mesmerizing. By strictly adhering to the elements of line and color, but at the expense of volume, Pien creates drawings that look stencil-like, and further evoke the ancient art of Chinese brush drawing. Pien is an Asian-Canadian who immigrated to Canada from Taiwan at the age of 11. While reminiscent of Chinese art traditions, the artist reports he developed the monoprinting process in the course of his art practice. The technique is entirely his own. Born into a family of artists, Toonoo has deep roots in the artmaking traditions of his people. 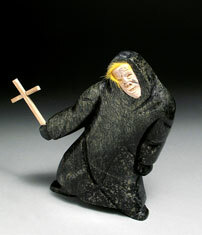 He adds embellishments to traditional-looking stone carvings, such as a figure brandishing a wooden hockey stick, or cross hung around the neck of a hooded figure, to clearly place his work in the contemporary world. Detailing allows Toonoo to align obdurate stone and Inuit carving techniques with drawing, and drawing’s aptitude for editorial commentary. Loss of a need for boundaries, between not only artmaking epochs but also artmaking traditions, suggests we have arrived at a historical moment free from pastiche. Instead, artists are seeking out the terms for a deeper kind of renewal. Once again art proves its relevance as a prognosticator of what is to come: a loss of dominance for the West in a Globalized world. You are currently browsing entries tagged with Pierre-Francois Ouellette Art Contemporain at Army of YouTube.